Vered Strapp ’93, a member of Gann Academy’s English faculty, is a graduate of Newton North High School, received a Bachelor’s degree from Harvard University and a Master’s degree in English literature from Columbia University. 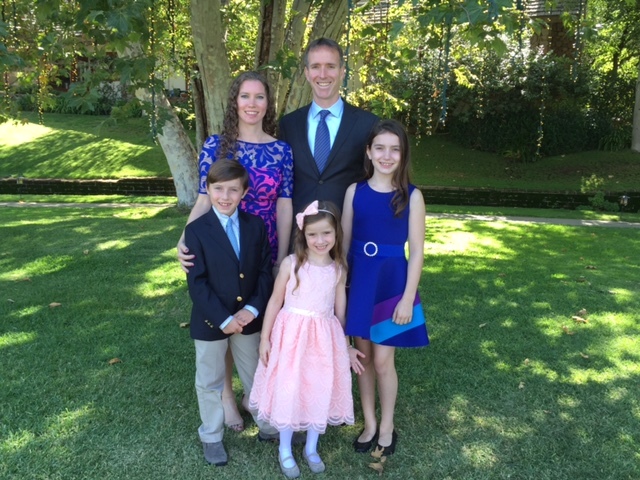 Vered and her husband Michael live in Newton with their three children Sabrina, Eitan and Morielle, all of whom are Schechter students. I became a high school English teacher because I love working with students and I love literature. My job as a Rosh Edah at Camp Ramah made me realize that there was nothing more rewarding and fulfilling than working with children. I felt 100% job satisfaction at camp. I was in pursuit of that same feeling in my professional life. After college, I asked myself: why was I not feeling the same rewards working behind a desk in my cubicle as an editorial assistant at HarperCollins Publishers? I wanted to work in a literary field and surround myself with books, but the sense of creativity and joyful immersion in literature that I thought I’d find in book publishing proved elusive. I applied to graduate school in English literature and, at the same time, threw my hat in the ring for teaching jobs. I had no idea that I would feel so at home in my first teaching job in Manhattan. The euphoric feeling was there—I was immediately challenged and invigorated by the constant buzz of school life. And I enrolled in graduate school right when I started teaching, which was a true gift. While thinking about how to make literature resonate with my students, I was able to be a student myself in the university classroom and continue on my own journey of lifelong learning. We imagine that you think a lot about your former teachers as you do your work. Are there Schechter teachers that stand out for you as teachers to emulate? My Schechter educators were the most unbelievably devoted adults I could possibly have surrounded myself with during those exciting, fragile, tenuous years of childhood and adolescence. How lucky I was to have teachers at Schechter interested in knowing my heart, not just informing my mind. They showed me and my classmates how to think, and every day in their classrooms we felt our intellectual curiosity unfolding a bit more as we grappled with the deepest questions about our identity. Who would we adolescents become? How would we live authentically as traditional Jews in the next century? How would we look outside our insular selves and empathize with those in our greater community? I still have enduring relationships with several of the outstanding educators I was blessed to learn from at Schechter, and their voices are constantly in my ears. Each day at work, I channel their collective wisdom: How would David Wolf respond in this situation? How would Bonnie Weiss have picked apart this text? How did Alice Lanckton create a student-centered classroom? How did Rabbi Elkin inspire critical Talmudic debate? How did Mrs. Jacoby, Lisa Micley, Varda Ben-Meir, Rina Cohen, and Rebecca (Kempler) Levitt make me feel so much better with a smile and a hug when I felt the most vulnerable? It’s hard to think of myself on the same plane as my Schechter teachers. I revere them. I owe them so much. I can’t name them all right here, but their influence upon me is profound. You are not only an alumna, but also a current Schechter parent! How is it to be back at the school? How do your children’s experiences compare to your own as a Schechter student? As I walk down the hallway at Schechter, I am overcome by nostalgia. Strains of Hebrew songs are belted at full volume by earnest third graders standing on risers. Small children, holding siddurim, are clapping and swaying intently in prayer. Basketballs thud in rhythm in the gym. Whimsical student artwork decorates the walls. And then, just when I’m feeling most at home, I’m dazzled by images that are so new and fresh and different. Sleek labs are equipped with cutting-edge gear. Books are open on high-top tables beside iPads and other gadgets as students collaborate. A sukkah now stands in the front yard as a peaceful retreat, right beside beds of corn stalks planted and cultivated in science class. Something else is also new: Rebecca Lurie, my dear friend and Schechter classmate, is our new Head of School. David Wolf taught Rebecca and me in fifth grade, and now he is teaching my oldest daughter. The years go by, the school grows and changes, and yet the heart of our community is still there. Schechter pulses with a new energy nowadays, an energy that inspires my children and their friends to be their best selves each day. New families are discovering Schechter, becoming leaders in our burgeoning, diverse community. As a parent and an alumna, I’m so proud of our school.